SACRAMENTO, Calif. — Two condemned multiple murderers, including a serial killer, apparently committed suicide within hours of each other on the nation's largest death row, California officials said Monday. Officials said that while both men's deaths are being investigated as suicides, there is no indication that their deaths are related. Corrections officials said they found Andrew Urdiales, 54, unresponsive during a security check at San Quentin State Prison late Friday. He was sentenced to death on Oct. 5 by an Orange County judge for killing five women in California, and previously faced the death penalty for three murders in Illinois. The California victims were Robbin Brandley, 23, in January 1986 in Mission Viejo; Maryann Wells, 31, in September 1988 in San Diego; Julie McGhee, 29, in July 1988 in Cathedral City; Tammie Erwin, 20, in April 1989 in Palm Springs; and Denise Maney, 32, in March 1995 in Palm Springs. The murders occurred while he was stationed at various U.S. Marine Corps facilities in Southern California. A woman who survived a 1992 attack by Urdiales, Jennifer Asbenson, described her harrowing getaway to "48 Hours" in the 2011 episode, "Escape from a Serial Killer." He previously was convicted of killing Cassie Corum, 21, and Lori Uylaki, 25, both from Hammond, Illinois; and Lynn Huber, 22, of Chicago, in the mid-1990s. Former Illinois Gov. George Ryan commuted his sentence to life in prison in 2002 for two murders, and his third sentence was also commuted when Illinois banned the death penalty. He was then extradited to California to face charges there, and he had been on California's death row since Oct. 12. Separately, authorities say they found Virendra Govin, 51, unresponsive alone in his cell in a different death row housing unit late Sunday. Both inmates were being held in single cells at the time of their deaths, according to a prison statement released to CBS San Francisco. An autopsy will determine their causes of death. Govin was sentenced in December 2004 for committing four Los Angeles County murders. The victims were Gita Kumar, 42; Plara Kumar, 18: Tulsi Kumar, 16; and Sitaben Patel, 63. 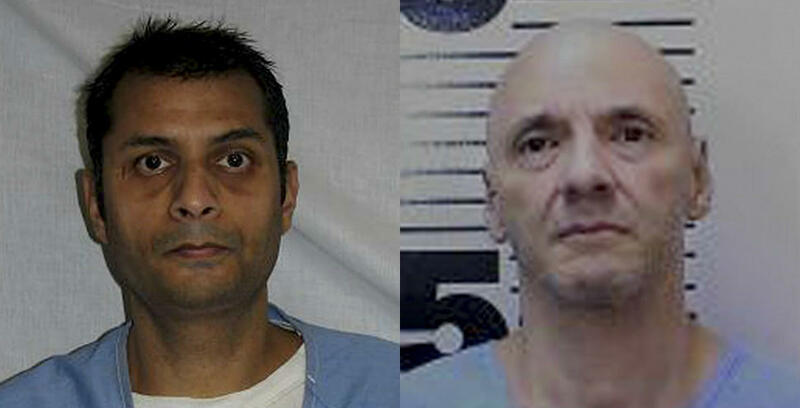 Govin, his brother Pravin Govin, and Carlos Amador, then set the Kumars' home on fire in 2002. Govin arrived on death row in January 2005. His brother, Pravin, has been on death row since September 2005. All male prisoners in California on condemned status are housed at San Quentin in maximum-security custody level units, reports CBS San Francisco. But California has not executed anyone since 2006 and inmates are far more likely to die from suicide or old age. Since California reinstated capital punishment in 1978, 79 condemned inmates have died from natural causes, 25 have committed suicide, 13 have been executed in California, one was executed in Missouri, and one was executed in Virginia. There currently are 740 offenders on California's death row. While suicides are not uncommon, the pair of deaths comes weeks after a rare slaying. Officials said Jonathan Fajardo, 30, was fatally stabbed Oct. 5 in a recreational yard. Fellow inmate Luis Rodriguez, 34, is considered the suspect, but investigators were trying to determine a motive and how he obtained or was able to make the weapon. The suspected suicides were announced the same day that a federal court-appointed special master who oversees prison mental health care criticized California corrections officials for proposing that they be allowed to start negotiating an end to federal oversight of suicide prevention efforts. Special master Matty Lopes called the state's proposal "incredibly premature" given the continued problems outlined in an expert's report also released Monday. Attorneys representing inmates said the state's suicide rate is, for the second year in a row, on track to exceed 24 suicides per 100,000 inmates. That was before six suicides since Sept. 1, including the two on death row. That far exceeds the national state prison rate of 16 suicides per 100,000 inmates. The exchange came as a federal judge considers appointing an outside investigator to weigh a whistleblower's allegations that top California corrections officials are misleading federal officials about improvements in the treatment of mentally ill inmates. State officials again denied that there was any fraudulent activity but said some mistakes have since been corrected.